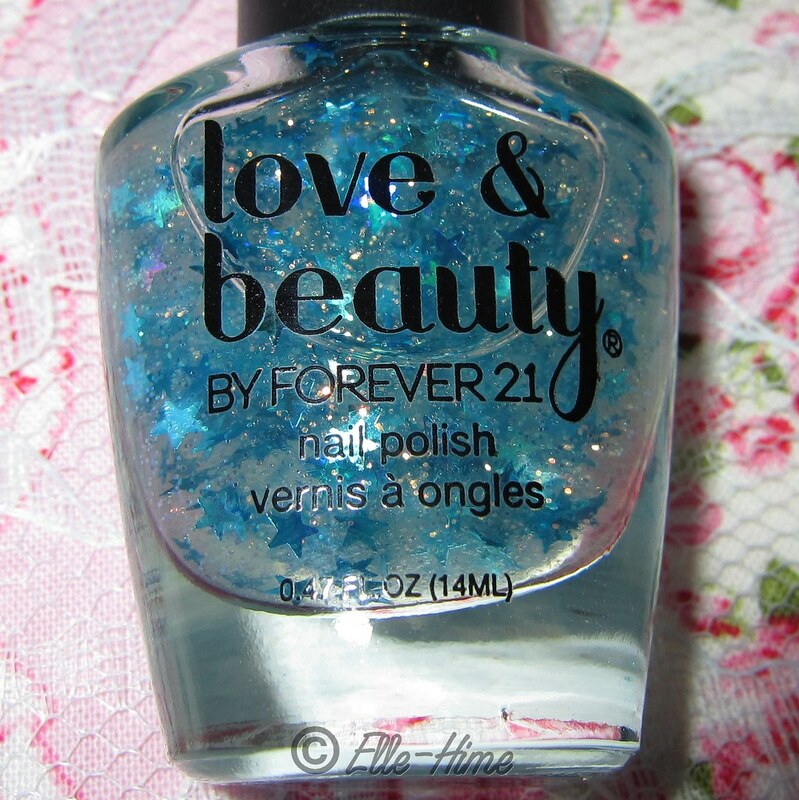 I picked one nail polish out with my last Forever 21 order. I'm always drooling over their accessories and every so often they have some neat polish up for grabs. I don't have a F21 store nearby, so I just chance it going by Online descriptions, and get to be surprised when it all arrives. When I was unpacking this bottle I was at first afraid it wasn't going to work for me, seeing all the orangey-yellow sparks in the bottle, but then I looked closer and I realized it is something special. 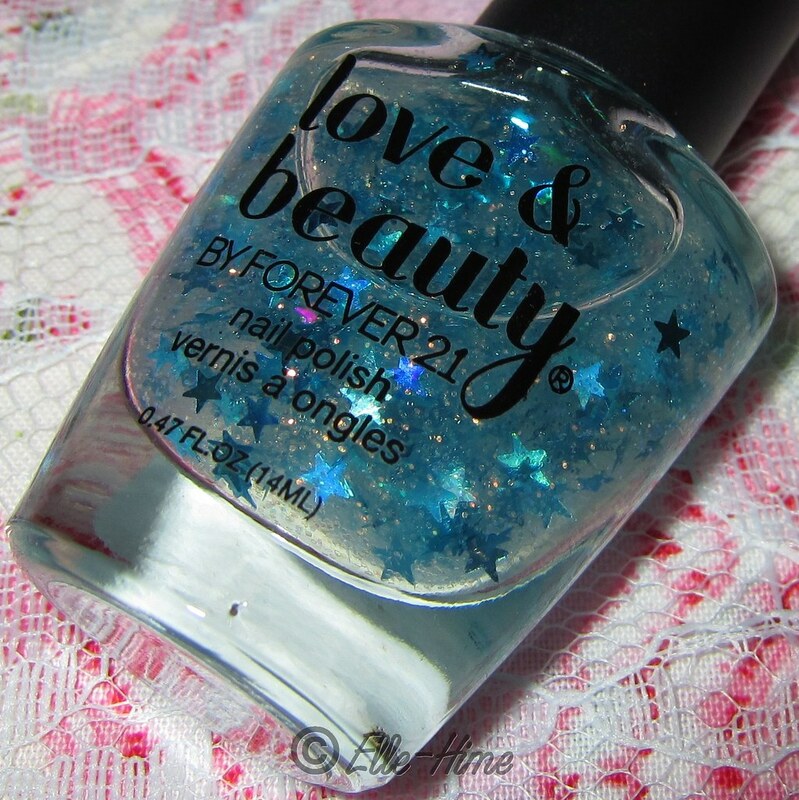 This nail polish has no real name - the label just says Blue/Clear; Online it is listed as "Blue Stars Nail Polish". 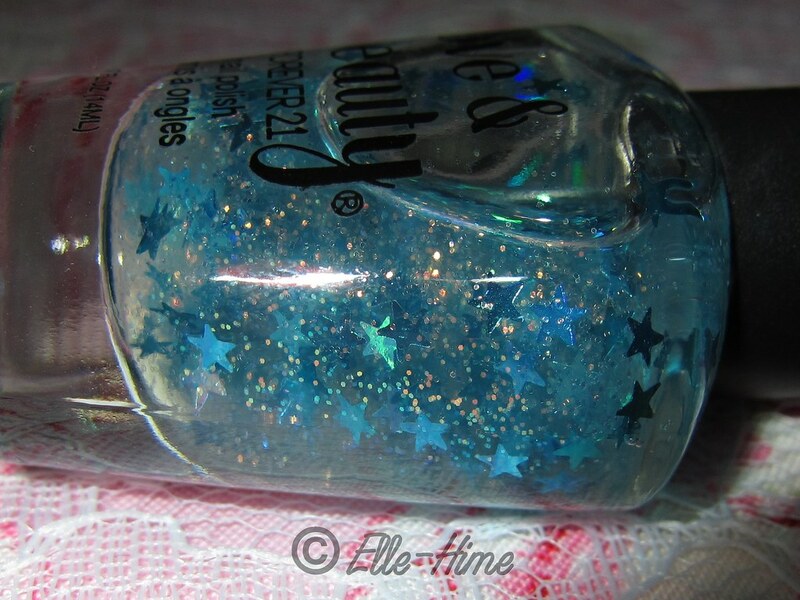 But when I looked at it in person, saw the flashing aqua-blue stars and unusual iridescent glitters, to me this polish is Sea Stars. More about the glitter polish after the jump. I have to say that last week was really, really rough for me. I was having a bout of being depressed, sad, whatever you want to call it, and after a week I really wanted my usual chipper demeanor back. (So did my family and boyfriend, it was rough for all of us.) So when it was time for my nails to be refreshed I went for the happiest color I could. 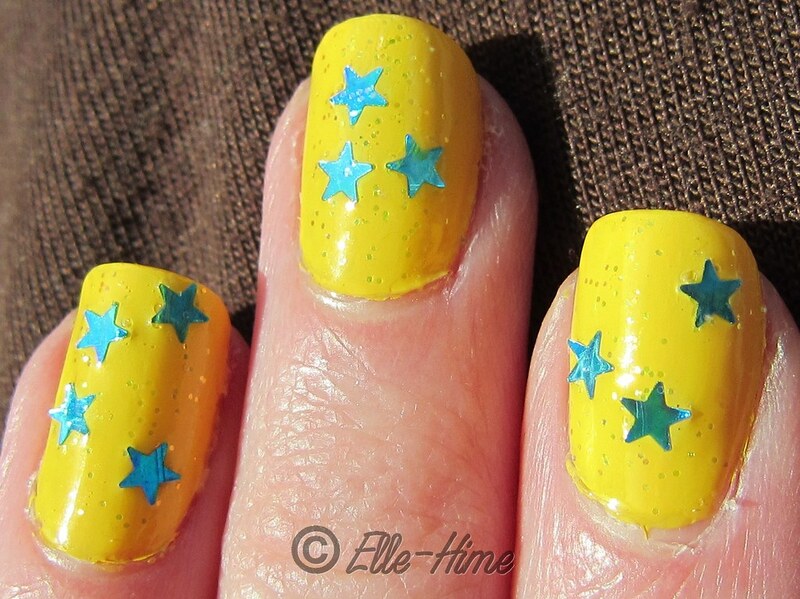 China Glaze Happy-Go-Lucky was my yellow creme base - 2 coats. It actually looks better on my skintone than these pictures suggest, but it is pushing for me, I know. Fortunately my mood did pick up yesterday, along with the sunshine. 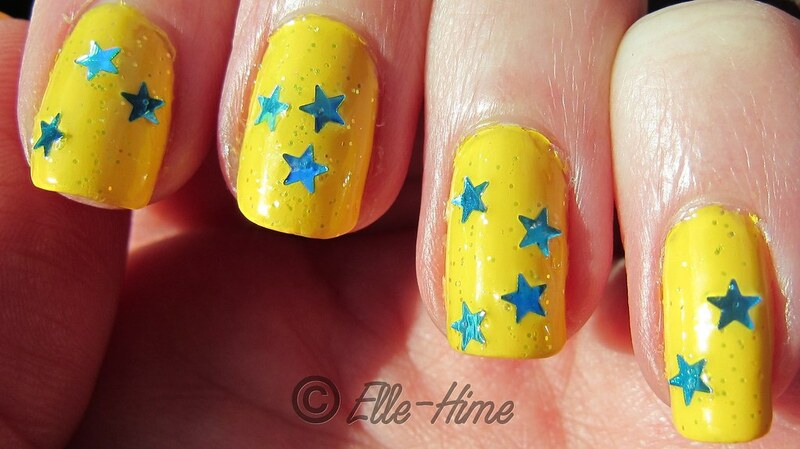 These nail pictures are taken in full sunlight, no flash. (Love my new camera - I took these in a moving car!) If you'd like to see glitter bottle shots keep reading! 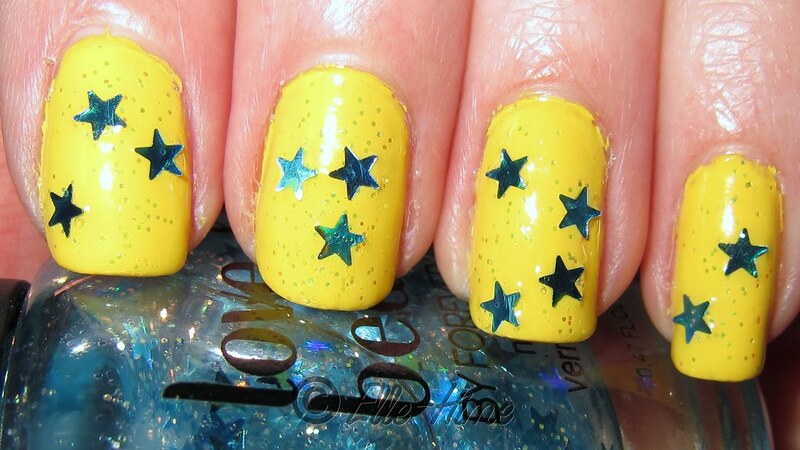 This polish is loaded with stars. I used two coats in the pictures but more often than not so many star glitters came out on the brush that I was wiping them back in. Pictures couldn't fully capture how the stars are holographic. They mainly shine aqua blue, teal and green, but at the right angle they show yellow and orange. The smaller hex glitter is really special. It is sort of a cross between color-changing and iridescent. It sparkles both yellow, orange, and blue-green colors. Really pretty and unique. 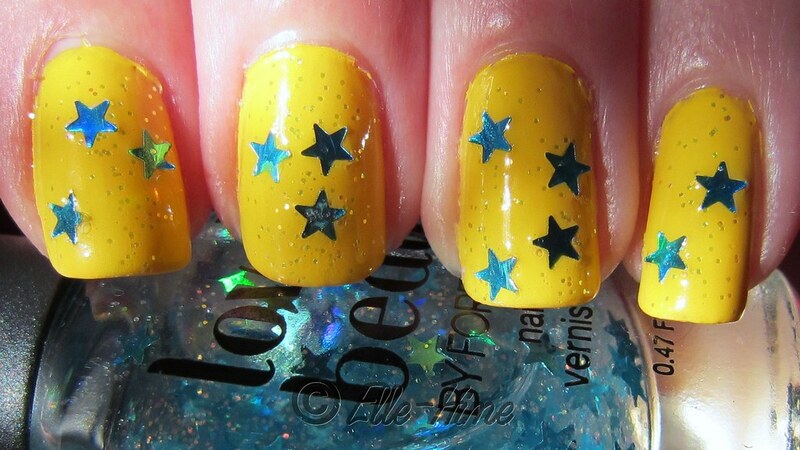 The only drawback about the Love & Beauty polish is that you need a thick layer of topcoat so all points of the stars are sealed in. Happy-Go-Lucky by China Glaze is a very nice polish but I think mine needs a little thinner added. It didn't seem to want to self-level very much at all. My nails again in mottled sunlight. This is really cute! Makes me wanna run to Forever 21 and pick some up! PS I am really new to your Blog, but so far i really love it! Yes, I thought of Flounder, too!! If you try it please show a picture! fax payday loan tramadol it is very important to pay for back the money entirely as well as promptly. normally, the car title loans california payment term is situated with a weekly pay period, but sometimes paycheck loans can be obtained with extended repayment periods too.